One of the major new parts of the Blended Retirement System (BRS) is the ability to take either 25% or 50% of the discounted lump sum value of the servicemember’s pension at the time of retirement. While the DoD is planning to release an overall BRS calculator at some point, I currently do not know of any plans to release a calculator that specifically looks at just the lump sum calculations. So, I built my own Blended Retirement System Lump Sum Calculator based on my best understanding and exhaustive analysis of all the currently published BRS documentation. First, if you haven’t studied up on the BRS read my overview posts here, here, and here. Otherwise, here are the pertinent facts regarding the lump sum. The source document for most of this information comes from the 31 page implementation memo here, but I’ve summarized the key changes, updates, and implementation details of the lump sum below … unless you like reading dry governmentese. Of note, the earliest anyone under BRS will actually be eligible to get the lump sum will be in 2026 because active duty BRS enrollees must have less than 12 years of service on 1 Jan 2018 which means that it will be 8 years from then before the first possible lump sum can be awarded at retirement after 20 years of service. The retiree must make the decision to select the Lump Sum payment NLT 90 days before their retirement date or for those in the Reserve Component, NLT 90 days before the they first becomes eligible to receive retired pay under the non-regular retirement program (usually at age 60). The servicemember may elect to receive the discounted present value of either 25 percent or 50 percent of the gross estimated retired pay. DFAS will make lump sum payments to the retiree NLT 60 days after the date of retirement. The subsequently reduced pension lasts until the member reaches full retirement age (FRA) according to the Social Security Act, which is currently 67 for most servicemembers. One important note here is that the member’s FRA is grandfathered in at the time when they make the lump sum selection in case the FRA would otherwise rise later on. Retirees who accept the lump sum distribution may not seek any kind of retroactive review or challenge of the mount due to any changes in the future from deviations in the cost-of-living adjustments, actuarial assumptions, or other factors used in computing the lump sum amount. Before getting into the specific lump sum methodology, we need to cover the financial concept of the Time Value of Money. This principle explains that receiving money today is worth more than receiving the same amount money in the future because the money today can be invested at a given rate of return. A simple example can help illustrate the point here. Say I give you the option to give you $100 today or $100 a year from today. Excluding the effects of inflation which can be illustrated by how our grandparents could once buy a soda for 5 cents, in our example you are just considering the opportunity cost of what you could do with the $100 today instead of next year. If you could invest that $100 at a safe 5% annual interest, come next year you could have $105 ($100*.05 + original $100) instead of the $100 I offered in the original example. This simple example illustrates the broader point that money is worth more today than in the future because of what you can do with it in the meantime. We also have to understand how to value a pension to understand this principle better. Ultimately, a military pension is an annuity that will pay the retiree a guaranteed stream of income for their rest of his or her life. The formula to determine the value of a retiree’s lump sum is calculated by the Present Value of an Annuity where a discount rate is used to determine how much the future set of cash flows are worth in today’s dollars. Go watch this Investopedia video if you would like another example. Once the discount rate, annual annuity payments, and number of years are known, we can calculate the Net Present Value of the Annuity in excel or Google Sheets. The Time Value of Money means that any lump sum payment the retiree will receive will be discounted back into today’s dollars. 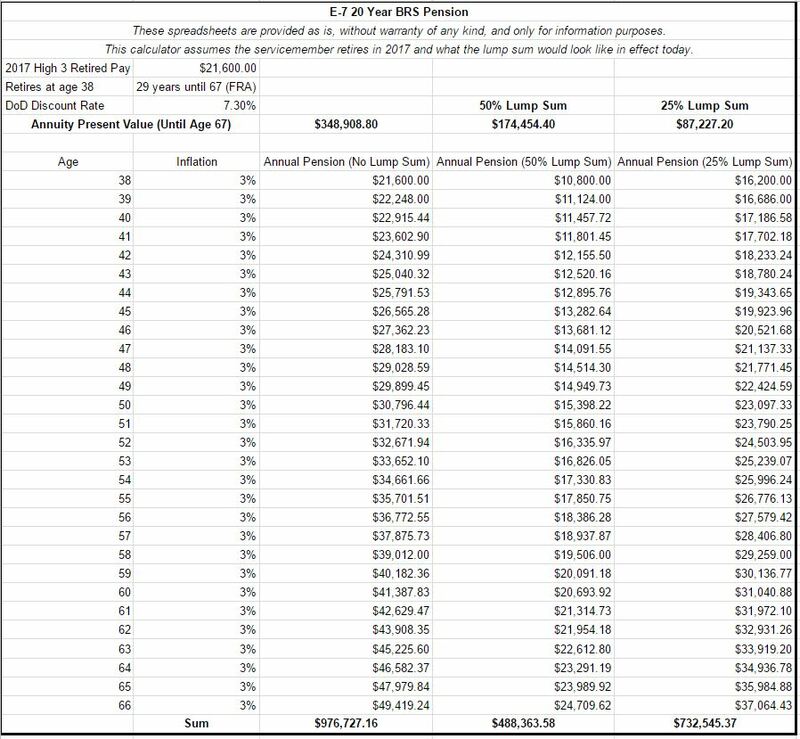 In our E-7 example below, while the retiree might receive close to a total pension sum of $976,000 (using a 3% annual inflation adjustment) from age 39 – 67, the discounted value of that $976,000 in the present would only be worth about $348,000. So What is the Blended Retirement System Lump Sum Discount Rate? By my research using recent Department of Treasury data, the total discount rate calculated as of Jan 2017 would be approximately 7.3% (3.02% + 4.28%). The OSD office of the actuary’s figure will differ slightly based on when they calculate the rate as the rates adjust up and down on their own according to market variables. The 4.28% adjustment will stay the same though. An approximate way to think about this is borrowing from your retirement pension at an interest rate of 7.3% which is pretty steep when you consider the guaranteed nature of the pension and completely unguaranteed aspect of anything else you could use this money for. 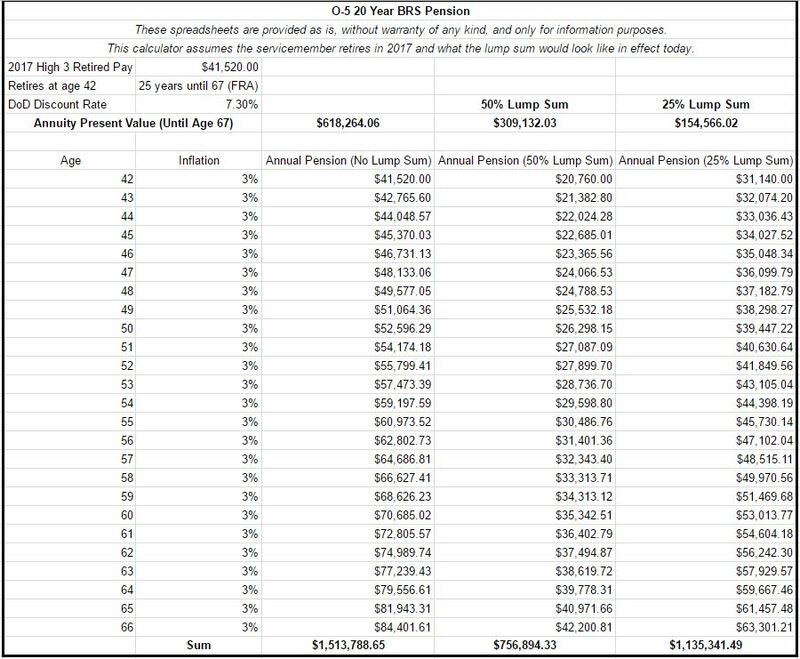 I’ve created a very rough lump sum “guessestimate” calculator on Google Sheets where you can see an approximation of what a lump sum might look like in 2017 dollars for an E-7 or O-5 who were retire at 20 years. Note that these numbers could look very different once more details are released by DoD. Using my Google Sheets link, you can see the actual calculations or change the variables to see what a lower or higher discount rate would mean. Another key consideration for evaluating the Blended Retirement System Lump Sum Calculator is to examine the impact taxes would have on receiving such a large sum. A few things should be clear though: a military pension is incredibly valuable so the decision to take a lump sum should not be taken lightly. Given how many servicemembers took the REDUX option in the past, I’m sure that many servicemembers will be likewise tempted by the option for such a large cash sum. I’m absolutely a huge fan of the BRS overall, but the lump sum has some specific headwinds. Based on an adjustment factor of 4.28% plus the prevailing market conditions, it will be very difficult for any military retiree to gain more through investing the lump sum amount than he or she would have earned keeping the full pension. Add in the taxes paid on the large lump sum payment/s and the decision to take the lump sum becomes even worse. Based on what I know now, I cannot really recommend that anyone should take the BRS lump sum as it is a steep discount for what the servicemember could otherwise get as the guaranteed pension. Let me know what you think and if you would consider other factors I didn’t mention! Where did you get your 3.02% for the HQM Corporate Bond Spot Rate? Looking at the data from the link you posted to quandl, for the last 7 years the rate for 23 year maturities has never dropped below 4% (except for July ’16 with a rate of 3.98). So how are you getting 3.02%, it should be higher. This doesn’t affect your conclusions except for the fact that it is even harder to come out ahead after taking the lump sum. Great question Brent. I didn’t get into the details too much in my post since I wanted to keep the focus on the lump sum amounts specifically. The difference between the actual HQM Corporate Bond Spot Rate above 4% and the 3.02% in my calculation comes from the inflation adjustment using the Department of Treasury “Breakeven Inflation Spot Rate Yield Curve” as the stand-in for inflation. This articles discusses that concept a little more – http://www.calculatinginvestor.com/2011/01/24/inflation-expectations/. The January 2017 HQM Corporate Bond Spot Rate was 4.5% and the Treasury inflation rate was 1.48% giving the final number of 3.02%. My calculation method is also probably not quite as precise as the government actuary one will be, but I know I’m very close. What if someone entered the military at age 36? Would you say it would be wise for them to take the lump sum considering once they retire at age 56 and only have to wait 11 years for annunity payment to go back up? Also what is and how would you calculate the annunity for say E7 or O5 that retires at age 56 with 20 years of service? Thanks for the helpful info!! If you go into the Google Sheets calculator I linked to in the article you can modify and change it to model what that scenario would look like. The biggest thing is it would reduce the lump sum payout since there’s only 11 years of discounted pension payments to calculate the lump sum with. My original opinion still stands though as it is incredibly difficult to make a better rate of return than you would be getting with the lump sum discount.